The first time you use your student ID card with the printing system, you will need to register the card. This enables the printer to link your card to your student printing account. 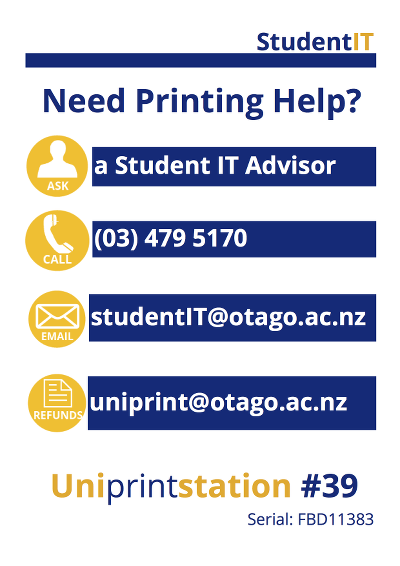 Remember to log out after registering and after any printing, copying or scanning. Once you have registered your card, you will need to add money to your printing account using either the top-up kiosks or the online top-up system. Printing and photocopying incurs a charge but scanning is free. You are now ready to send your document to the printer. You can print directly from the Student Desktop or your own computer or device. You don't even have to be on campus to send your print jobs! You don't pay for your print job until you pick it up from the printer. You can use any Uniprintstation printer to print out your print job. These printers can be found in student computer labs and libraries - look for the Uniprintstation label shown below. These printers can also be used to scan and photocopy. Your print job will disappear from the queue after 10 hours, so make sure you print it out before then.